Makar Sankranti or Uttarayan as its called in Gujarat is the only festival which follows the solar calendar and falls every year on 14th January. This festival is celebrated by many states of India for different reasons. Its the beginning of the harvest season, its the end of the inauspicious phase which begins during mid December, its the end of the southeast monsoons. Mainly everyone celebrates this day because it marks the beginning of the transition of the Sun God from the southern to the northern hemisphere. Many states fly thousands of colourful kites on this day as an oblation to the Sun. During Uttarayan different states make different sweets. In Gujarat the most popular is tal sankari or tal laddus. Made from jaggery and sesame seeds, it is eaten so that one does not suffer from coughs and painful joints during spring. The other significance of making tal laddu is eat it and speak sweetly throughout the year! Tal sankari is very easy to make. Its Namrata’s favourite indian sweet. The colour of the tal sankari will depend on the colour of the jaggery or gur used. If you are making pieces, then grease a tray 8 inches by 8 inches and keep it ready. Also grease the bottom of a small steel bowl or a glass and keep it ready. Mix sesame seeds, peanut powder and cardamom powder in a bowl. In a heavy based pan, put the ghee and let it melt over low heat. Add the jaggery and keep on stirring till it melts. Let it cook over gentle heat till you see tiny bubbles appearing at the edges. Don’t let it caramelise otherwise the sankari will be hard. Add the milk to it. Mix well. Immediately add the sesame mixture and mix well. Take the pan off the heat. Immediately put the mixture into the prepared tray. Pat it down evenly with the help of the greased bowl or glass. Cut the mixture into squares or diamonds, using a sharp knife or a steel spatula. Leave it to cool for half an hour. Remove the pieces from the tray and store the tal sankari in an air tight container. If you want to make round balls, then let the mixture cool a little, but should be still quite warm, and make balls by rolling the mixture between your greased palms. 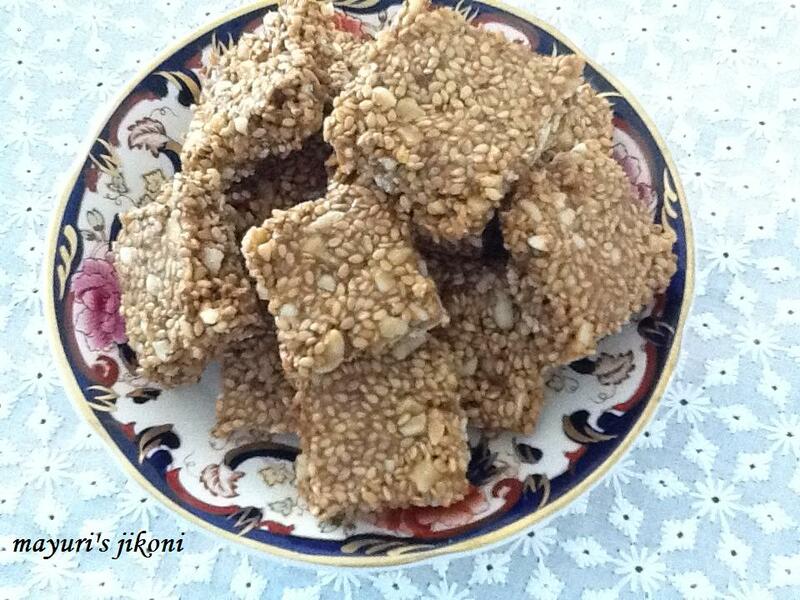 If you do not want to use peanuts then substitute it with sesame seeds. If you don’t have a square tray, just use a small round steel plate of any tray. Roast the sesame seeds and peanuts over low heat or in the microwave oven for 1 minute or less. Coarsely powder the roasted peanuts. Thickness of the tal sankari depends on your preference.